this is a blog called geometricsleep. : Wowee Zowee! 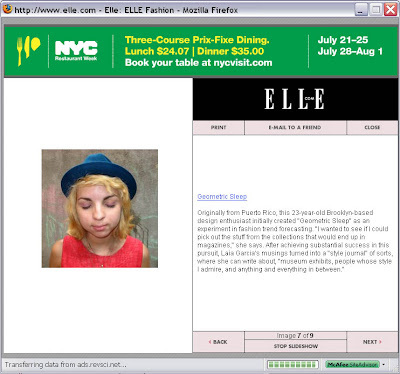 Omg you guys, my big ole' mug is all up on Elle.com! Can you believe it? And I am in the best company ever; Elizabeth, Louise, Jackie and Garance (among others) were all featured too! Total insanity. Yay! Thank you Celia (and Nicole) for getting in touch with me! Labels: blogs, Elle, omg what? This is beyond awesome. Congrats! AH! Love it!!! 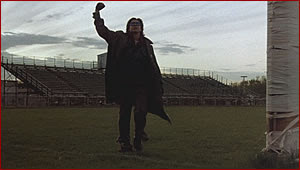 Seriously we are the breakfast club :) congrats sweetie you beyond deserve it!!!! all my favies!!! yay for laia! that is so cool! congrats!! I’m so happy and proud! I telepathically send you my heart bursting love, wonderful being! I tiptoed the mentioned blogs and found out they're all so unique and different, so strong and creative, capable of making almost anyone fall in love with fashion and art. Whoa congrats Laia! This is awesome! This is so amazing! I'm so proud of you! Congratulations, you should be so proud! That's so exciting! And that's how I found your blog!